One of my favorite desserts in the world is the always delicious Coffee Cake. 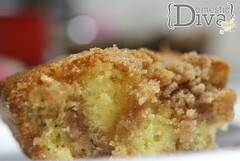 Today I am going to share with you a Coffee Cake recipe that I make in my home probably once a month. It is great treat in the mornings with your favorite cup of joe or in the middle of the afternoon as a quick snack. Whip up cake batter according to box directions and set aside. In a separate bowl, combine flour, cinnamon, brown sugar, sugar, and nutmeg. Cut in butter until crumbly. In a buttered and floured sheet pan, pour half of the cake batter and spread out evenly. Top with half of the crumb mixture. Pour remaining batter on top of crumb mixture evenly then top with the remainder of the crumb mixture. Bake in the oven for 30-45 mins depending on the size of your pan and how quickly your oven cooks. Test cake after 30 minutes by sticking a toothpick or strand of uncooked spaghetti in the center, if it comes out clean you are done. Cake may be slightly wiggly in the center when you remove it from the oven, this is perfectly alright, so long as the toothpick comes out clean your cake is done. It will finish setting up while it rests and cools off. This cake can be frozen for several weeks. What I like to do is freeze individual pieces and the night before take one piece out and place it in the Fridge to thaw out and enjoy the next morning with my coffee. The Cinnamon Coffee Cake looks just delicious! My mom’s birthday is coming up. I will try and make this recipe for her birthday. How big is your sheet pan? I usually use a 9″ X 13″ pan. Can’t wait to try it! Gonna try and make this tonight.Looks great..